We finally left the north of Ethiopia and back to the big smoke to travel on to Adama as Jon wanted to spend some time with his beloved computers! He had been in touch with Camara, the NGO that he volunteered with in Dublin. They have a hub in Ethiopia and so we had planned to stop there for a few days of volunteering to give Jon a fix of fixing PCs. Our timing in a way couldn’t have been better as Camara were having their official opening the same week and had invited some hobnobs from Ireland such as Minister Trevor Sergant. Much to Jon’s disappointment the Camara crew were so intent on getting the launch right that there wasn’t much time for working in the repair workshop. We enjoyed the launch night, hooked up with the Irish Camara crew and downed more than a few beers. It was certainly great to see Irish faces other than Jon’s for the first time in four months and nice to hear some Irish humour again. Not nice hangovers though…. Thanks Feyissa, Cormac and Donal for making us more than welcome. Addis Ababa beckoned again and although I hated being back in the city it was for good reason as Polly was finally arriving into Ethiopia and I couldn’t wait to see her. It was brilliant to catch up and see a friend from home. It was made even better by the cheddar cheese and Cadburys chocolate that my mammy had given Polly to bring over. As most days I dream of cheddar cheese, it was devoured immediately, warm and oily that it was, delicious. It seems these days more Irish people were in Addis than in Dublin and more beers and laughs were had with another friend, Ali whom I play hockey with. Much to Jon’s amazement at how I manage to always meet someone from Genesis Hockey Club wherever I go!!!!! We choose to go down South to the Great Rift Valley Lakes for our last week in Ethiopia. It was only afterwards we realized why there are so many 4×4 tour jeeps with tourists in them and why we met no other independent travelers on the way as it was proved really difficult traveling. We headed to Lake Langano on the public bus with everybody chewing Chat, the local plant which is a mild narcotic. I was excited as we got off the bus as it was very rural and beautiful with lots of acacia trees, small mud huts and not much else. It was a 3km walk to the hotel on a dirt road with no transport except a horse and cart which we eventually hopped onto. My excitement didn’t last as the hotel prices were ricidously expensive, with no double room and the last straw was when the receptionist quoted us 400Birr (32euro) to get back to the main road. We figured the resort was for peoples with loads of moula and not littly backpackers like us. Reluctantly we started the 3km trek back to the main road with our packs, hoping a car or something might pass us on the way. Halfway there tired with very sore shoulders and the hours a ticking, I thought I would be quite happy setting up my sleeping bag and mosquito net under a tree for the night, until Jon mentioned hyenas and so I changed my mind and kept walking. Finally we arrived back to the main road, quickly squeezed onto a passing bus and headed for the nearest town Arsi Negele (and what a load of arse it was). I have never been in a town like it and never ever want to be again. It was with huge difficulty that we found a ‘hotel’ that had something that resembled a room with a toilet that was usable. Our cheapest hotel yet for yes only 2euro!!! We ate plain dry spaghetti for dinner, had some beers to try and numb the pain and went to bed early and woke early the next day. It was a case of how quick we could get out of here. Afraid of touching the shower or taps or anything, we packed and left and got the first bus south to Shashemane. Our hotel was like The Hilton after our previous night and we relaxed in its simple luxury. Onwards we went to a place called Wando Genet, famous for its natural hot springs. The bus dropped us at the town, where we sat and waited for transport up the 3km steep hill to the hotel. So many people came to stop and stare at us it was like we were from the moon. Finally with no other transport, we hopped onto a horse and cart but only to get off it five minutes later as the poor horse was in such a bad state and was being whipped and beaten to get up the hill. Jaysus I thought the other walk was hard, this was really tough and even the local women we passed were shouting ‘good strong women’ at me. The walk was rewarded by a fantastic dip in the hot hot springs where we wallowed our aches away. The hotel was surrounded by lush green mountains and waterfalls which we explored the next day with a local guide. 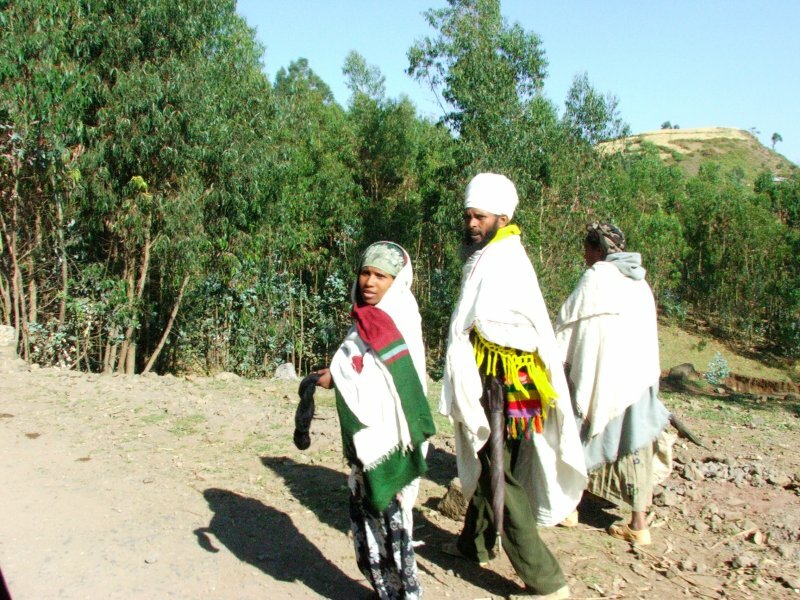 We were accompanied by local kids, one named Tigallah, aged about 6 or 7 who came armored with his machete, stick, wellies and a fabulous haircut (shaved all over bar a tuft at the front so that Allah can grab him when it’s time to go to heaven). All sorts of wildlife were abundant such as colobus and vervet monkeys, olive baboons and loads of birds. It was almost as difficult to leave Wondo Genet as to arrive, we waited in the town for a bus to show and show they did but as the locals were running after it to try and get on, and we hadn’t a hope with our bags. We sat and waited and Jon played the staring game with the locals and finally managed to get on one. Two more buses later we arrived into Awasa, it took us four hours to travel under 40kms. We had hoped to stay at Lake Awasa but every hotel was booked up with local weekenders. It seemed our luck with lakes was running out but decided to head back to Shashemane the next day to organize a trip into Lake Abiata and Lake Shala National Park. This we managed with much ado and went off with our hired car and driver, not knowing we would just make it back alive. The park itself was wonderful, fantastic scenery with mountains as a backdrop behind the two lakes and the famous hot springs were hot hot, so hot the water was bubbling up out of the ground. However the drive back turned into a nightmare, with our driver seeming to be so reckless and careless that I thought at one stage he must be having a fit of some sort. But he wasn’t and as it got dark I got really scared as the one no no in Ethiopia is never to be on the roads at night and with good reason. Finally we arrived back with nerves shattered and needing a cigarette, which I didn’t have and a beer, which I did have, I regained my composure. So that was the South, back to Addis the next day to civilization, good food and hotels!!!! Well Ethiopia is no more and to think at first we were not going to visit the country and to think that I fell in love with the country and spent five weeks there. It was a country that had spectacular scenery, amazing culture, fantastic people, crap food unless you like cold soggy injera, difficult traveling and but I loved it all the same. With ringing ears and snivelling nose I arrived at the Ghion Hotel in Bahir Dar with my Molly. My head stuffed full of cotton wool and now indifferent to my surroundings. Bed for me please Ted. 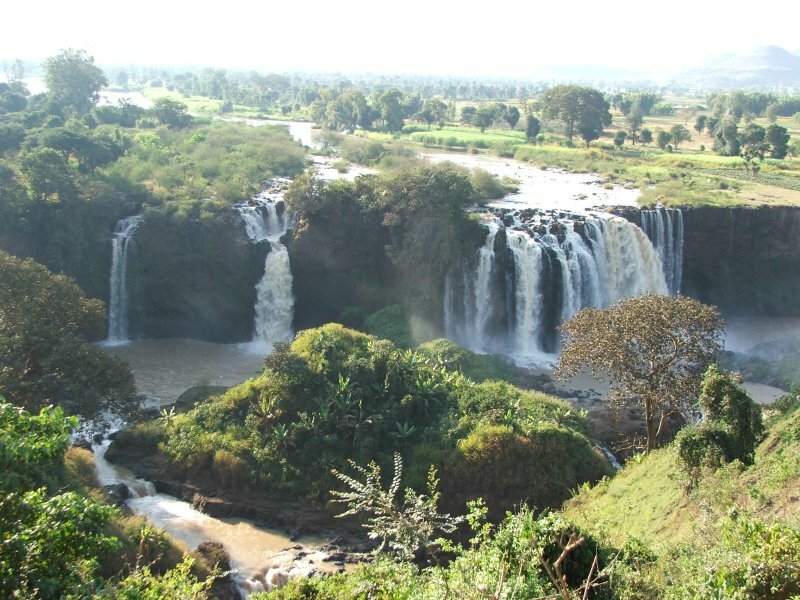 It took me another two days to recover, weakened but spirits undampened we headed off to the Blue Nile Falls. 30km away on a dirt road and a hike over some hills the falls revealed themselves. 50 meters at their highest and relatively full they were amazingly noisy! 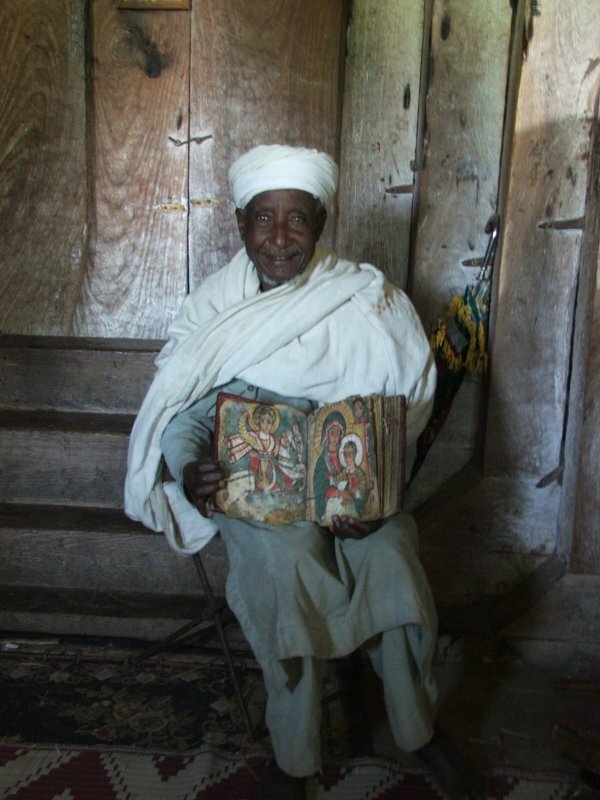 We returned to the palm lined streets of Bahir Dar to arrange a trip out onto Lake Tana and its ancient monasteries. As we were pressed for time we decided to visit just three over three hours or so. 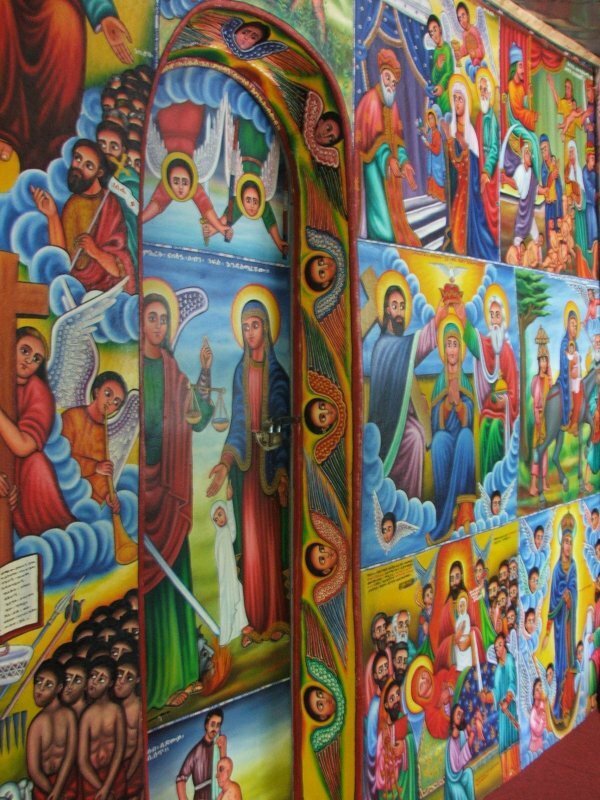 Each “church” very different and all adorned with stylized Christian images and icons. Every church with its own guardian and caretaker eager to show off their ancient goat skin parchments. 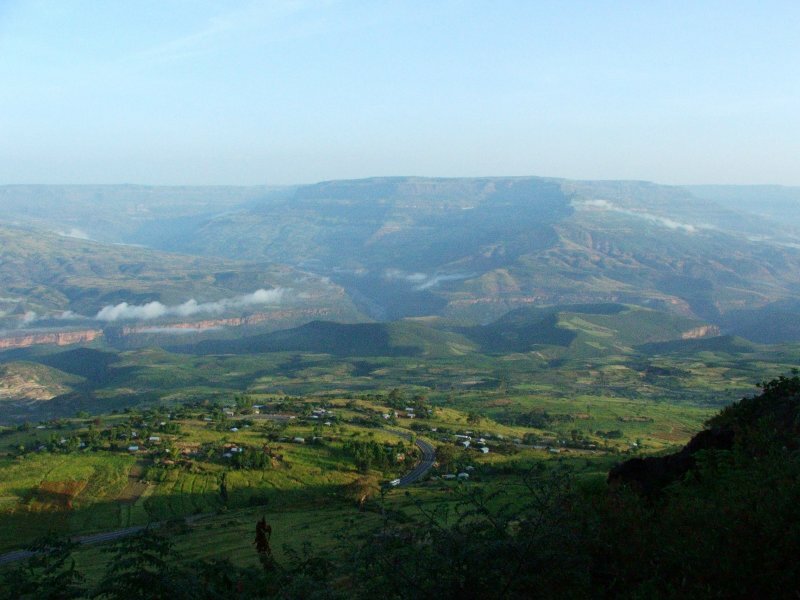 After an unplanned stay of five nights in Bahir Dar we were keen on a change of scenery. Again, coffee fueled we boarded our mini-bus for, Lord of the Rings sounding, Gondar. For me, Gondar is akin to Shimla in India. Steep streets, an open area at the top, people walking everywhere, tuk-tuks, and old guys draped in traditional shawls brandishing a long walking staff. Our hotel, The Ambaras Hotel, ( thanks Alex for all of your help !!! ), has amazing views out over the mountains with Eagles blasting pass our window constantly. We headed out to the Royal Enclosure aka Fasiladas Castle. An extremely tranquil place covering 7 square km. Built in the 16th Century and enlarged piecemeal for 200 years. It really feels like an African Camelot. Since arriving here there is a real sense of history. Regarded by many as the “Cradle of Humankind” this country feels old. 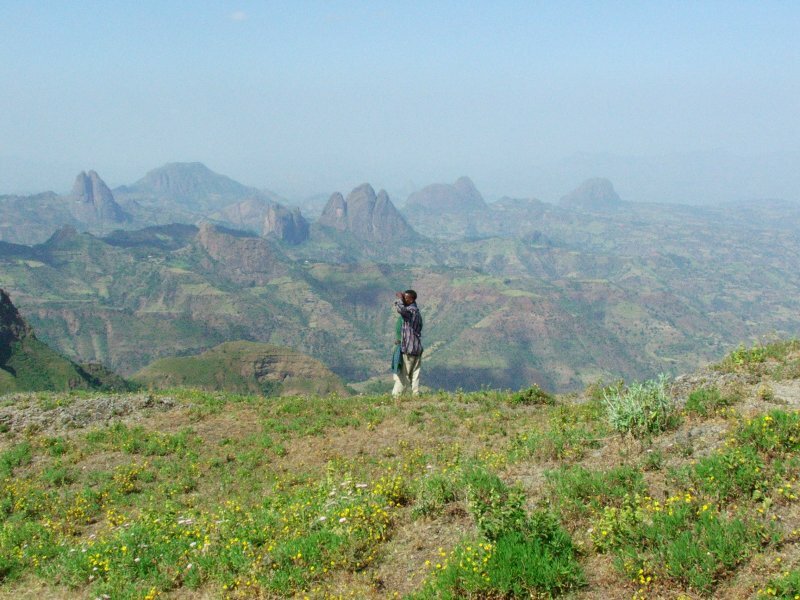 In the short time I have been here Ethiopia has surpassed all my meager expectations. Lush and green, abound with well dressed and seemingly affluent people, good traditional food, and ( last but not least ) an array of beers! When you get over the initial culture shock this place will leave you stunned, surprised, tired, infatuated and wanting more. At 4am Silent Night was murmuring across the speakers after weaving through immigration in Addis Ababa. Feeling a bit ropey, sinuses as dry as a bone, after our business class trip (ahem! ), we haggled with a taxi driver and eventually made it to our hotel in the deserted Piazza area of Addis. 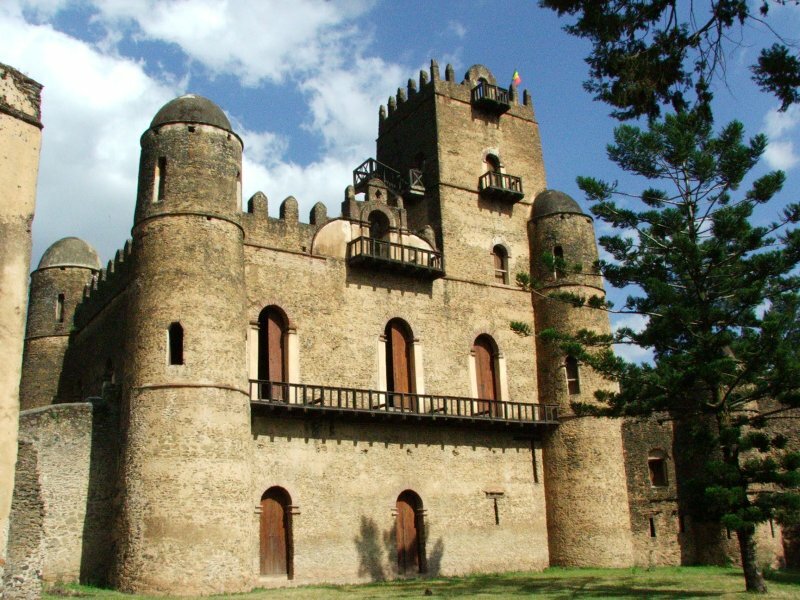 The Taitu Hotel, built by Empress Taitu over 100 years ago, was old school Ethiopian and impressive but COLD ! Us just not used to this frosty 15-20 degree weather! First order of business; warm clothes and sleeping bags etc. in preparation for the north and Simien mountains. That night we sampled the local fare. 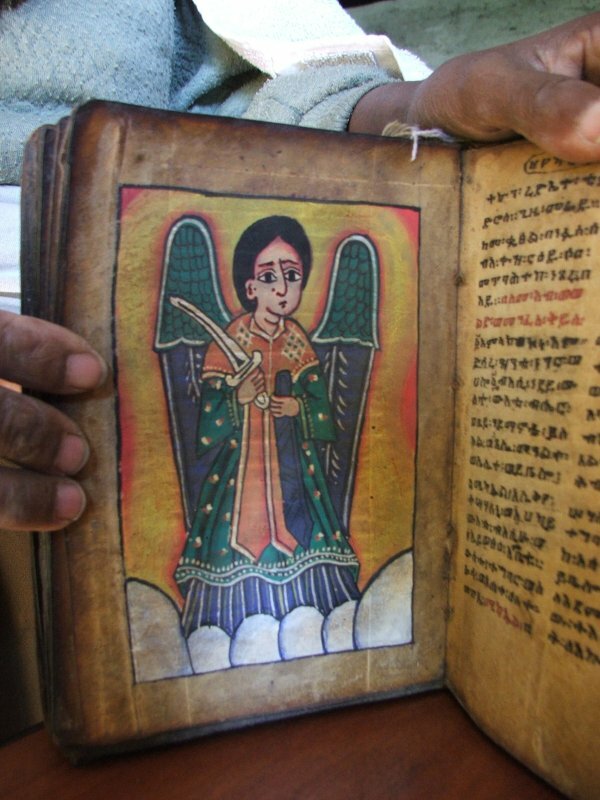 Injera is just a large, cold, barley pancake with various hot sauces on top. Eaten by hand. I’m not mad on it but they do have a good selection of beers to wash it down. AND COLD TOO! The next night we had some scoff with some “save the world” types, (UN, Concern & Goal etc.). It was good to have a few beers with the first Irish people we had seen since leaving for Spain 4 months ago.